Should the Eagles Pursue Nnamdi Asomugha? Perhaps the biggest hole in the Eagles defense right now is at right cornerback, opposite Asante Samuel. Ellis Hobbs, Dimitri Patterson, and Joselio Hanson all got the chance to start in 2010 but none could even consistently play at an average level. 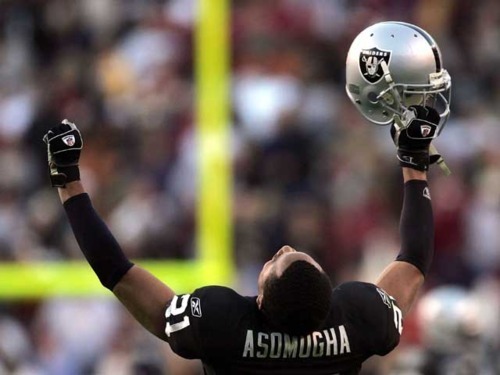 So going into 2011, fans have been clamoring for the team to add perhaps the biggest star on the free agent market — Raiders cornerback Nnamdi Asomugha. Asomugha is often touted as one of the best, if not the best cover corner in the league. The three-time consecutive Pro Bowler doesn’t come up with a lot of interceptions, but quarterbacks notoriously avoid his side of the field. Last year, according to Pro Football Focus, receivers Asomugha covered were targeted only 29 times for 3.7 percent of his snaps, by far the least in the NFL (Samuel was second with 41 targets and 6.1 percent). Certainly on talent alone, the Eagles have to be interested. They’re used to making big splashy free agency moves and have the cash to do so. Plus, considering the cornerback spot is a pressing current concern, the team likely won’t try to look to the draft for a remedy. But the main question mark with Asomugha is his age. The All-Pro will turn 30 on July 6th, and giving a long-term contract to a cornerback (or any player) at that age is risky business. As you can see from the table at right, Asomugha would be the second-oldest big-time acquisition the team has ever made. Additionally, consider recent Eagles history with cornerbacks. Troy Vincent stayed with the team through age 33, then switched to safety to prolong his career. Bobby Taylor had injury problems that preceded being let go at age 30, after which he only played one more year. Sheldon Brown lasted until just after his 31st birthday before he was traded last offseason to Cleveland. And while we might lament that decision now, keep in mind that quarterbacks throwing Brown’s way in 2010 had a 114 passer rating, third worst in the NFL among starting cornerbacks. 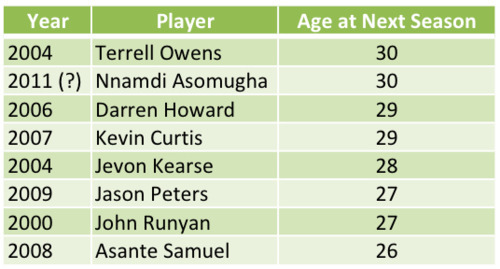 The broader trend among 30-plus year old cornerbacks isn’t particularly golden either. A free agent deal for Asomugha would have to include at least four years, if not more. But can he produce at a high rate for that long? 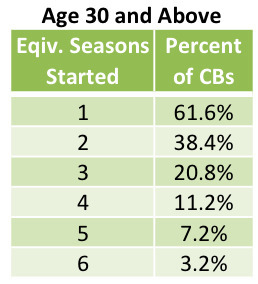 My analysis shows that among cornerbacks from the last 15 years who started at least one game after turning 30, less than 40 percent of them started the equivalent of two full seasons in their thirties. Only 21 percent managed to start three full seasons. Unfortunately, the vast majority of players are not Eric Allen, Ronde Barber, or Charles Woodson. They slow down, they get hurt, and they drop out of the starting lineup before you know it. What does that mean for Asomugha’s chances of coming to Philly? It depends on how risk-averse the Eagles front office is right now. Giving Asomugha a rich contract with heavy guarantees — which is what it will take to get any deal done — is no safe move. Maybe he’ll buck the odds and perform at a high level for years to come, making any contract worthwhile. More likely, if the Eagles do pursue him, it would be for a contract that puts big money up front but few guarantees down the road. At the end of the day, Asomugha is the type of player that could instantly lift the Eagles defense and conceal a number of other weaknesses. It’s worth getting excited about any potential addition of that caliber, even if some caution is also warranted. Originally published at NBC Philadelphia. Photo from Getty. Tagged with Philadelphia Eagles, NFL, Free Agency, Nnamdi Asomugha, Cornerbacks, Asante Samuel, Ellis Hobbs, Dimitri Patterson, Joselio Hanson, Pro Football Focus, Statistics, NFL Draft, Age, Risk, Sheldon Brown, Contract. February 23, 2011 by Brian Solomon.